The first page of The Delineator’s Paris Fashion report showed daytime clothes — suits, coats, etc. 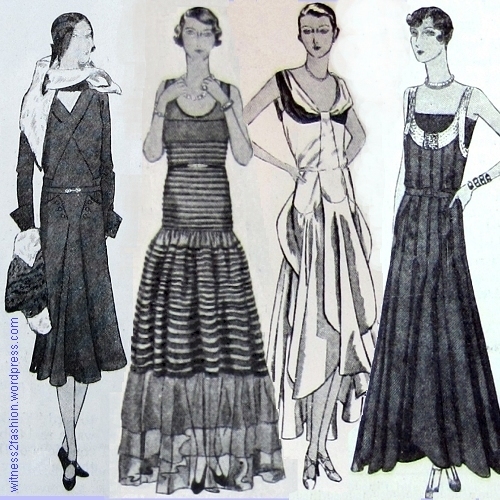 The second page showed a mix of evening and daytime clothing designs, sketched for the magazine’s November 1929 issue. 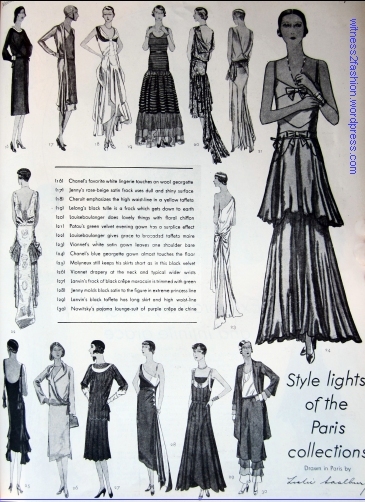 Paris Couture for day and evening, Delineator, Nov. 1929, page 27. 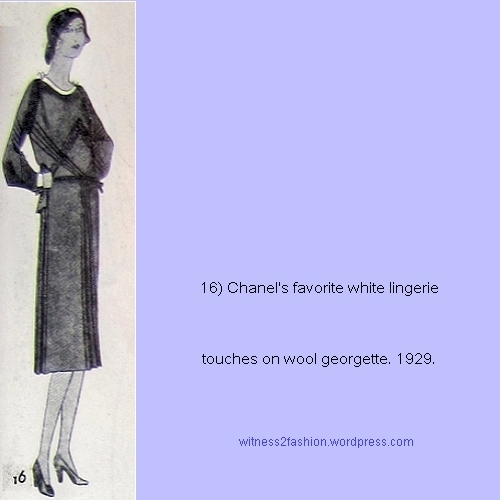 Chanel wool georgette dress, sketched in Delineator, Nov. 1929. p. 27. Similar tucks, used on the diagonal, can be seen on earlier dresses by Vionnet. Click here. 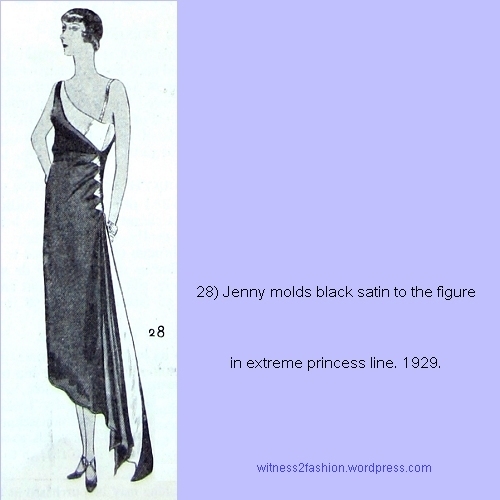 A satin dress by Jenny, sketched for Delineator, Nov. 1929. Crepe-backed satin can be used with either side out, matte or shiny. 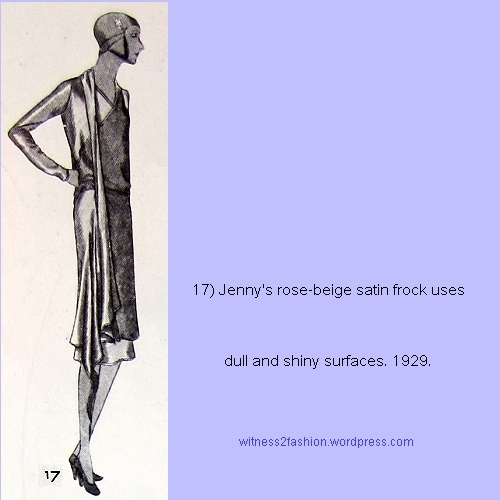 Jenny is one of the designers who was very successful in the twenties, but not much discussed now. 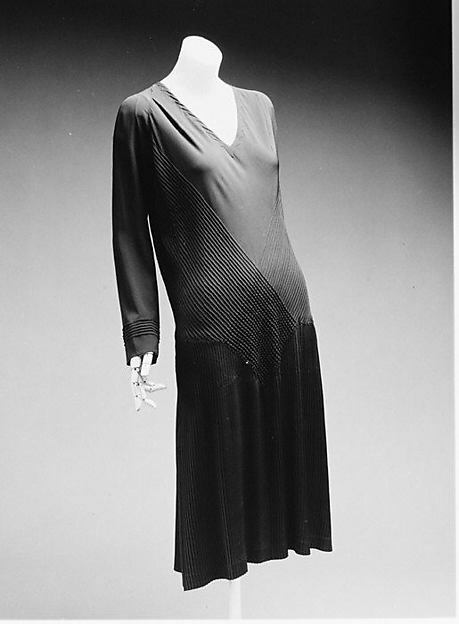 This 1930 dressing gown by Jenny is in the collection of the Metropolitan Museum. So is this embroidered coat from the 1920’s, with her label. Evening gown by Cheruit, sketch from Delineator, Nov. 1929. 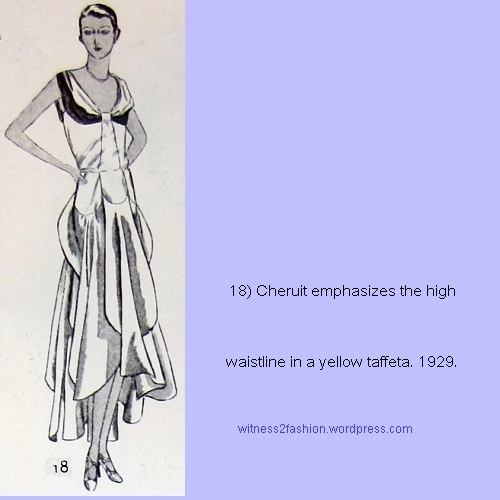 Cheruit’s elaborate gowns were successful in the first decades of the 20th century. (Click here for an exquisitely sequined dress (in an interesting article) at the Museum of London. After she retired, her house continued in the 1920’s; her premises were later occupied by Schiaparelli (1935). Long black tulle gown by Lucien Lelong, Delineator sketch, Nov. 1929. The tulle is in graduated tucks. 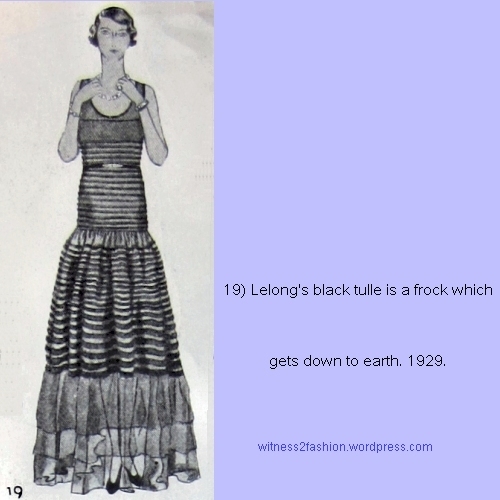 Click here for a black tulle Lelong gown from the early 1930’s. 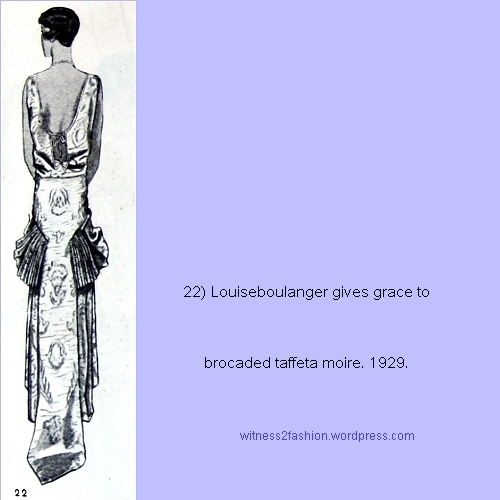 Floral print chiffon evening gown by louiseboulanger. Delineator sketch, Nov. 1929. 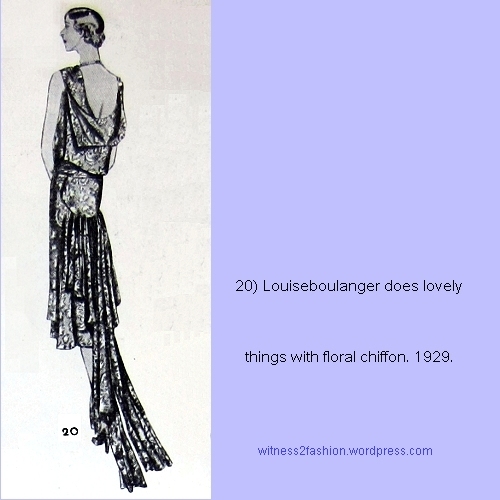 This evening gown, in the collection of FIT, is print chiffon, apparently from the same louiseboulanger 1929 collection. 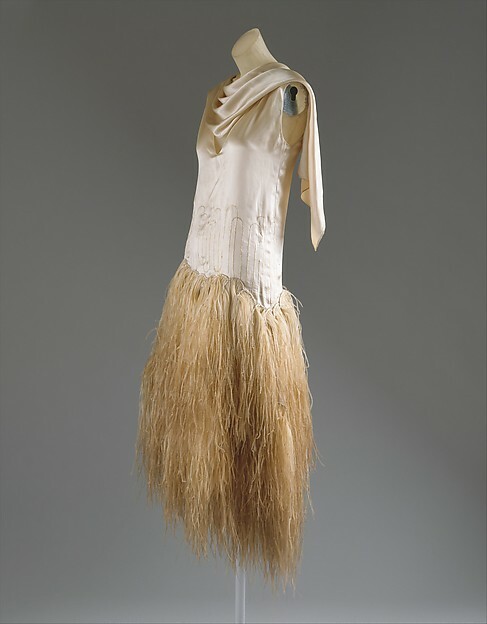 Click here for an earlier 1920’s evening dress by louiseboulanger — it’s short and feathered, and fabulous. Jean Patou showed this green velvet evening gown, sketched for Delineator, Nov. 1929. 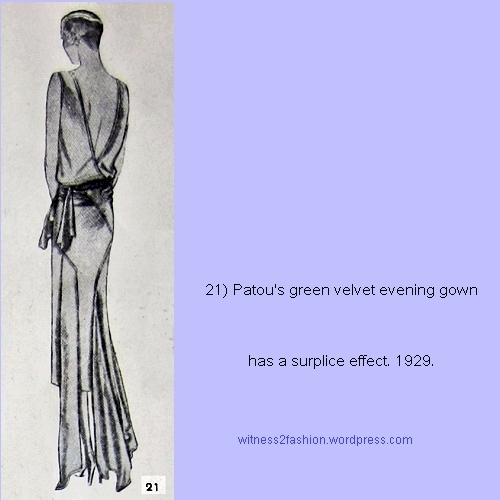 Another Patou from 1929 can be seen here. Moire taffeta evening gown by louiseboulanger, sketched in Delineator, Nov. 1929. Louise Boulanger worked under several variations of her name. The run-on, all lower case version — louiseboulanger — was the latest. White satin, one-shouldered evening gown by Vionnet, sketched for Delineator, Nov. 1929. 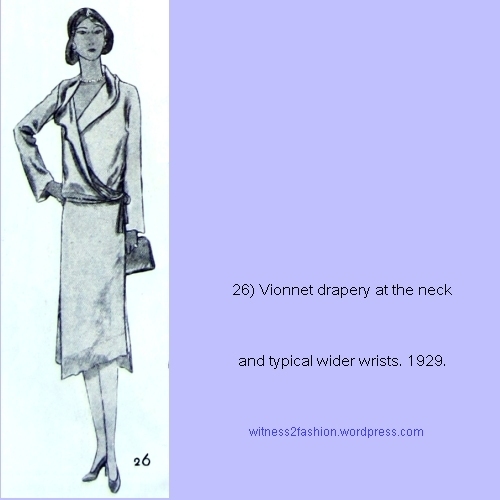 I have written about Vionnet before. Other evening gowns can be seen here and here. 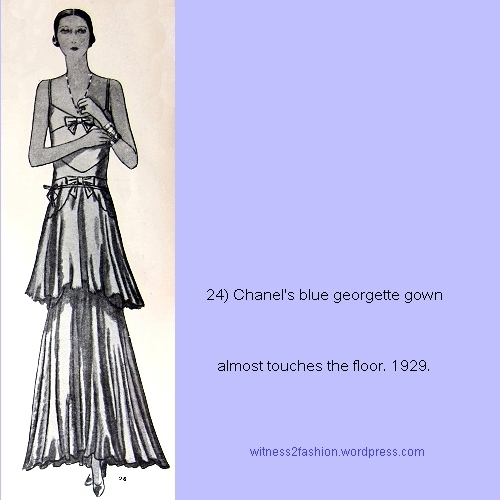 Blue georgette evening gown by Chanel, sketched for Delineator, Nov. 1929. A short black velvet evening dress by Molyneux, sketched for Delineator, Nov. 1929. A dress by Vionnet, sketched for Delineator, Nov. 1929. 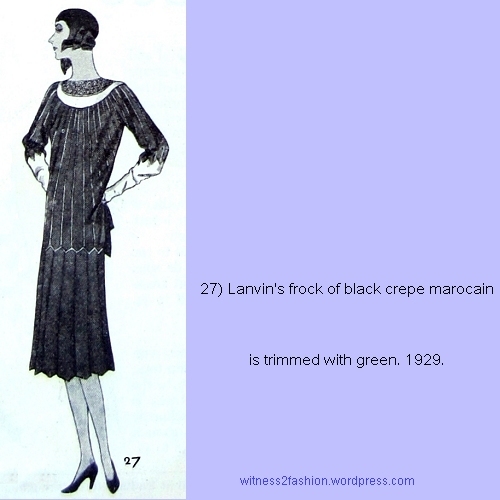 Black crepe dress by Lanvin, sketched for Delineator, Nov. 1929. Jeanne Lanvin joined the Syndicat de la Couture in 1909. 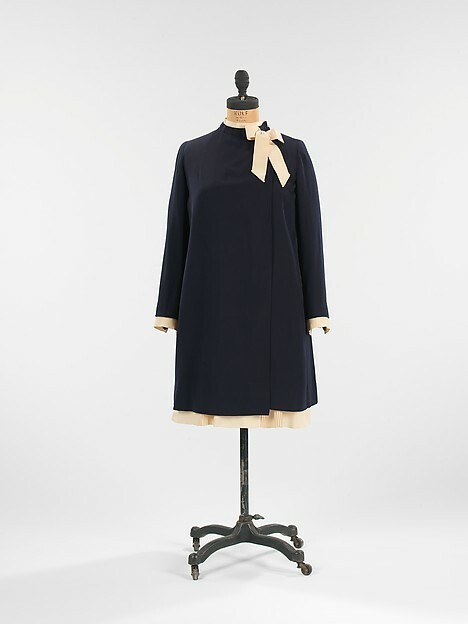 A coat and dress ensemble from Lanvin, at the Met, dated 1926, is so short that it looks nineteen sixties, on first glance. A tightly fitting evening dress by Jenny, sketched for Delineator, Nov. 1929. 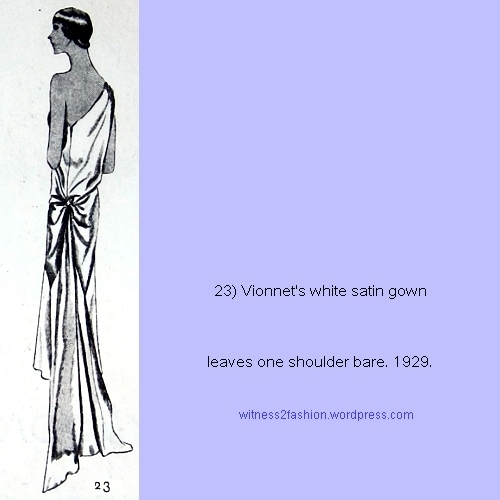 Like the Vionnet dress above, (#23) one shoulder is revealed and one is covered. 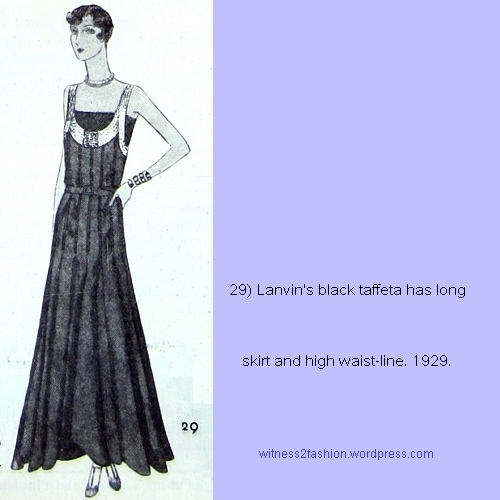 A long gown by Lanvin, Delineator sketch, Nov. 1929. The hem appears to be slightly raised in front. 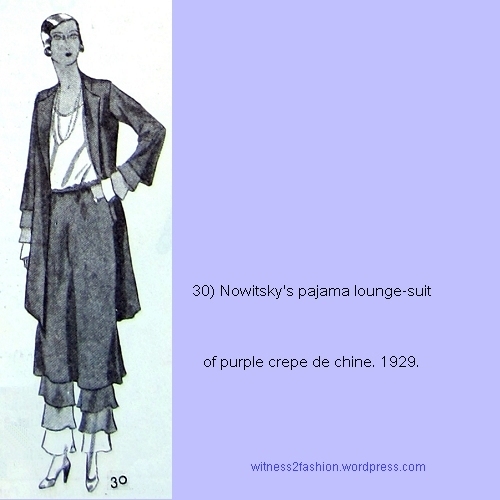 Purple lounging pajamas designed by Mary Nowitsky, from Delineator, Nov. 1929. You can see more about beach and lounging pajamas at The Vintage Traveler or here. 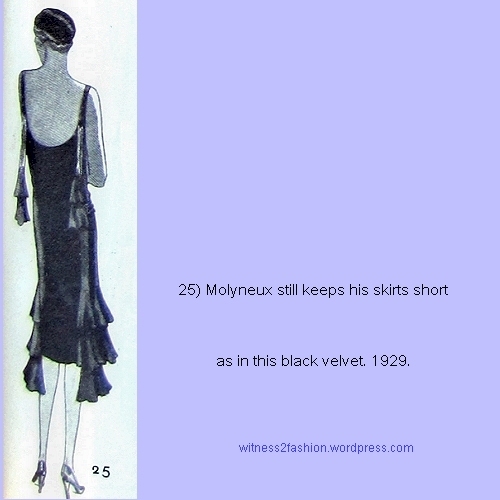 In Part 1, I mentioned that Jean Patou took credit for lowering the hemline in 1929. 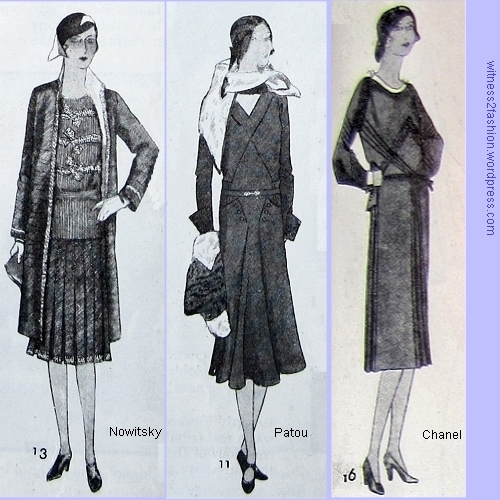 Here are three images from this 1929 Delineator article; Patou’s dress is slightly longer. Hems for daytime, Nov. 1929. Nowitsky, Patou, Chanel. Four designs from Nov. 1929. All have natural waistlines, accented with a belt. Belted coat from Sears catalog, Spring, 1929. A belt like this will tend to rise to the natural waist when tightened.